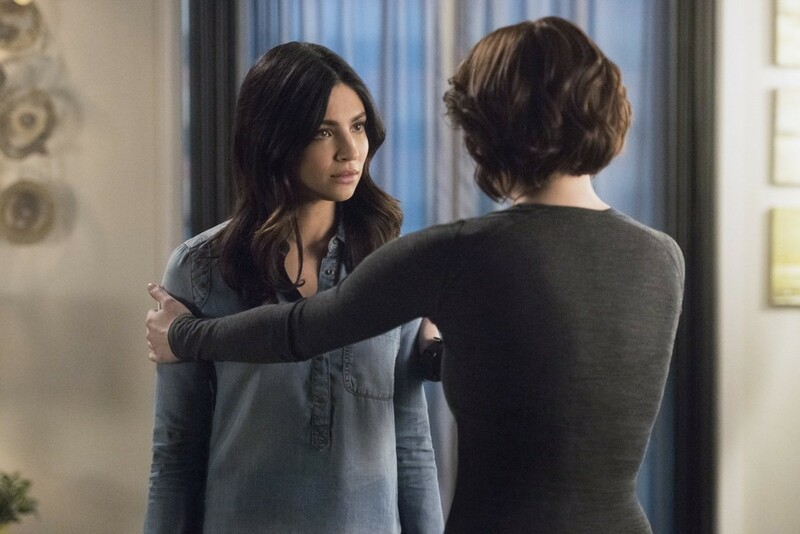 This week on Supergirl, we get an episode revolving around the relationships that revolve around Alex Danvers, which I am totally on board for, frankly. Alex has a pretty pivotal role in the lives of the people around her — Kara, Maggie, and basically all the DEO cares about her deeply — so when she’s put in danger, some hefty emotions can come out. Rather than Supergirl punching bad guys and saving the day, we get to see what Kara Danvers is like when she’s not literally powerless, but emotionally powerless. We get an intro that puts the two people who love Alex the most at opposition with each other: Maggie, while trying to talk some bank robbers out of escalating a hostage situation, gets interrupted by the arrival of Supergirl. Supergirl apprehends the criminals and dusts her hands of the situation, while Maggie probably has to worry about filing the extra “Arrest Interrupted By Superhero” paperwork at the office. The exploration of how the law deals with people like Supergirl is interesting and something I thought we would get more of with the introduction of Maggie, but it seems mostly resolved at the end of this episode so I guess not. Things aren’t made better later at dinner, with Mon-El questioning the point of having cops in National City right freaking in front of Maggie: a cop in National City. When is Mon-El going to learn tact, anyway? I’m waiting eagerly for him to become less of a total jerk to everyone around him, but it seems like none of Kara’s lessons on how to behave like a non-sociopathic adult are sticking. Mon-El’s blabbing causes a full-on fight between Maggie and Kara, with Maggie bringing up the fact that some criminals end up going free on “the Supergirl Defense” — an argument based around illegal vigilante justice and contaminated crime scenes. I really hope the writers don’t just drop this idea and never return to it, because it could make for a cool episode with a very different format. Supergirl on trial! Alex leaves to soothe Kara’s ruffled feathers and ends up in an elevator with our villain of the week, then in a tank when he kidnaps her. The next day, Maggie and Kara are worrying about Alex when Kara gets a call from our villain, who says he knows she’s Supergirl and that he wants someone named Peter Thompson released from prison or else Alex will die. Scenes of Alex trapped in her tank while Kara and Maggie scramble to save her are well-acted by Chyler Leigh and each one helps build the tension of the episode. But despite the episode being titled “Alex,” the real focus is on the people who love Alex. Unraveling the mystery of why Alex was taken, why her kidnapper wants Peter Thompson released, all the “plot details” only serve to bring out the emotions and the motivations of the characters. But here are the plot details anyway: The person who’s orchestrating this whole ordeal is named Rick Malverne, and Peter Thompson is his father. He believes that Thompson is unjustly imprisoned, even though Thompson confessed to two murders, and he wants to save his father to repay his father saving him from an abusive home life. Moreover, he was childhood friends — or at least associated — with the Danvers sisters and has followed their lives closely, learning everything from Kara’s identity as Supergirl to the existence and inner workings of the DEO. When Alex seems to be close to dying and Kara is wrestling with the morality of breaking Thompson out of prison to save her sister, Maggie takes matters into her own hands and uses her position as a police officer to get into the prison herself. Just before Maggie can drag Thompson out and hand him off to Malverne, however, Kara shows up to talk her down and get Thompson to talk some sense into his son. Maggie and Kara start the episode on opposite ends, with Maggie protesting that negotiation and careful, intelligent police work is the best way to get a job done and Kara arguing that going in and punching people real fast to ensure that the bad guys get put away and the good guys get saved is more effective. In true Supergirl fashion, Kara learns a lesson, and she takes Maggie along for the ride: Maggie ends up doing the Supergirl punch-your-problems thing by breaking Peter Thompson out, because doing so seems the swiftest way to save Alex. Kara is the one who negotiates and appeals to Thompson’s better nature, getting a result that saves Alex’s life and keeps Maggie from breaking the law. Both learn something about the others’ perspective and, with Alex finally safe, seem to grow closer as friends. The weak spot of the episode is Malverne, who is written as being an all-knowing stalker in the Danvers’ sisters lives. He knows Kara is Supergirl, he knows what the DEO is, he knows all their weaknesses and that J’onn can shapeshift and is a Martian. It’s like he watched the same show we’ve been watching for the past two seasons, and all this knowledge and power just comes off as a desperate attempt to make one of the only non-metahuman, non-alien opponents Kara has faced into a legitimate threat. They didn’t need to make him into the ultimate stalker to do this, though. The fact that Alex is the one in danger could have been enough of a threat — Kara’s secrets and this highly improbable amount of knowledge didn’t have to be added to the metaphorical scales for us to feel anxiety for Alex or for us to relate to Kara or Maggie’s anxiety, either, because we understood immediately what was at stake for those two characters. This unknown, unheard-of villain who had zero establishment and had to be retroactively added to the Danvers’ history muddies the narrative rather than clarify it. I feel like, if the writers had just trusted their actors a bit more and allowed them to take the emotional brunt of the episode instead of having the Malverne character sneer and speechify his way into ramping up the tension, it would have been enough. By trying too hard to make Malverne interesting, the episode creates distraction. I can’t fully believe in the motivations of this character when they’ve loaded so much onto him: an abusive childhood, observation skills that last over a decade of connecting logical dots, the ability to learn specific details about a secretive agency like the DEO, the technical know-how to super-triangulate phone calls, the ability to get the jump on someone like Alex and power down her subdermal tracker... Is there a version of the oft-criticized “Mary Sue” character trope that applies to villains instead of heroes? Because Malverne comes off a lot like that. A sub-plot of the episode revolved around where last week’s episode left off: Queen Rhea arriving in Lena’s office to discuss a business proposal, and by “discuss” I mean “plot evilly, because evil.” The business proposal turns out to be for a science-y... transporter... device? Look, I’m clearly not as smart as Lena is because I have no idea what they’re technobabbling about. The point is that Rhea is trying to partner with Lena and pass herself off as human, Lena and Rhea kind of bond over similar family troubles, and then Lena finds out that Rhea is an alien and wants nothing to do with her. Until Rhea apologizes, which appears to pull Lena over to her side. Cutaways to Lena’s background storyline seem oddly placed in an episode that is primarily about Alex and the people who love Alex. But I guess Lena is tangentially connected by her friendship with Kara and that counts. Also, I suppose an episode in which Kara spends most of her time being too distracted to chat with her new BFF Lena is the only way Rhea could believably hook her claws into Lena. Any other time, and Kara would have talked Lena out of siding with any teleporting, queenly aliens playing the “estranged family members” sympathy card on Lena Luthor. Unfortunately, Kara does not get to Lena in time, and it seems that Lena has, yet again, entered a relationship with a woman aiming to manipulate her against Supergirl. And I, yet again, have to worry about the writers doing the disappointing thing and making Lena evil. Sigh. I like ham and pineapple pizza too. Fight me. “You never look before you leap.” “Because I can fly.” Touché. I’m here for Alex and Maggie getting a dog named Gertrude. Maggie and Kara hug! Everything’s fine.